Let us take a break from horse shopping to check in with our hero. How has Rodney been while I have been plotting his replacement and Mathilda has been taking up all my time? Fat & happy. Remarkably so. At night, we put him up in a stall and bed down the aisle to give Mathilda room to rest or move or graze as she sees fit. We figure she won’t overexert herself as she is a) basically sensible and b) loathe to leave her boy toy. To keep Rodney out of the rafters during her rehab, we cut his food. He is now getting a third of what Mathilda gets, which is a ridiculously small amount for any horse, much less for an over-sized, high-strung Thoroughbred. He has responded by putting on weight. Plus, he is nowhere near as feral as I would have expected from past behavior. [Caution] I have several theories, but too many variables. It is article of faith with me that out is better than in. [Cowboy] However, when Rodney arrived, he tried to treat the aisle/run-in area as his stall. Perhaps he finds a measure of security in what used to be a familiar routine for him. He eats everything left in the stall with him. Even hay that has gotten mixing in with the shavings while Mathilda is in during the day. (We keep them separate, see above boy toy comment. Even when she was too tippy to urinate securely, she was still trying to pee & wink at him. A serious horse-of-negotiable-virtue.) When they are out 24/7, they have an all-they-can-eat hay buffet, which they ignore for green grass. Perhaps being locked in gives him nothing else to do but eat. 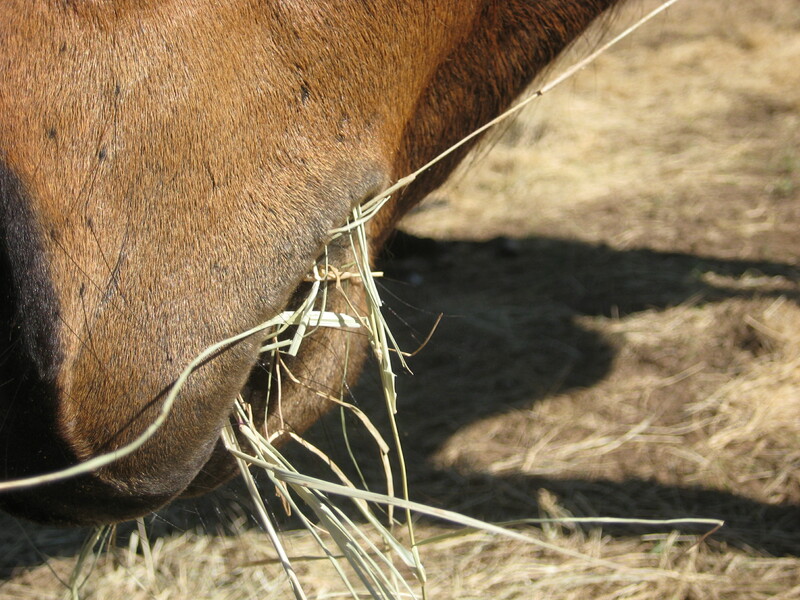 Perhaps the commercially-cultivated hay is more nutritious than grass off our clay-filled dirt. I’ve been working on tightness in his loin/flank area. Perhaps increased relaxation has led to fullness through the barrel. No work, a bit of heat therapy/massage, and grooming when I have extra energy has been the sum of direct attention Rodney has gotten lately. OTOH he is getting huge amounts of indirect attention. He gets his carrot during carrot checks. He gets pats as I walk back and forth. He sees me in the field as the three of us graze. Perhaps all of this adds up. Since one can’t do a double-blind, controlled study with barn care, we will keep all variables in mind moving forward to see which ones might be effective. As we slide through the second year of Life with Rodney, I can’t help but feel we ought to know him better by now. How long does it take you to feel you really know a new horse (or cat or dog or person)? The older I get, the more I see that I can never completely know anyone or anything, not even myself. I had Previous Horse’s number from the get-go. Never got on the same shelf, much less the same page, with Mathilda. OTOH, she is a QH mare. Rodney is my 4th bay, TB gelding. I should be able to speak BTBG better than I do.